Peachtree Park is a neighborhood in the suburbs of Atlanta that sits within the Buckhead community. 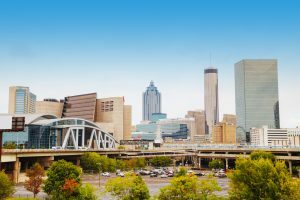 Over 500 homes line the streets of Peachtree Park, interspersed between a forest of green even while the skyline of the city looms beyond the tree line. The real estate in Peachtree Park is popular because of its fine houses and proximity to Atlanta staples such as the Lenox Square mall. It is also a historic neighborhood with a diverse set of architectural styles such as buildings from the early 20th century. In fact, the neighborhood can be found in the National Register of Historic Places. There are approximately 2,640 resident between the houses and apartments in Peachtree Park. The average resident is 38 years of age, very close to the national average of 37.8 years of age, and the vast majority of Peachtree Park households do not include children. Although a little pricey, the homes at Peachtree Park are large, beautiful and located in the 16th best neighborhood in the Atlanta area. The median home value is $341,232, which is well over the $184,700 national average. If you choose to rent real estate in this area, the average monthly rate is around $960, which is very close to the national average of $949. Approximately 56 percent of residents own their homes and the remaining 44 percent rents. As for places to live, this neighborhood is mostly made up of historic houses, so apartments are not as readily available for purchase or rent. Visitors will also have access to the largest Pottery Barn store in existence at Lenox Square. For community enrichment, Peachtree Park offers the Pocket Park Playground, where Halloween parties and other events for children occur, and the Peachtree Park Nature Trail, which has workout stations built-in along the path. There is also an annual Peachtree Park 5k that helps fundraise for the community and allows neighbors to meet one another. If you decide to purchase one of the single family homes in Peachtree Park, you will also have easy access to public transportation options. The neighborhood is conveniently located near the Peachtree Road and Lenox Road Metropolitan Atlanta Rapid Transit Authority (MARTA) stations, and you can hop on the Georgia 400 bus route at the east end of the community. Crime rates in Peachtree Park are low, with only two counts of assault and five counts of robbery in the area in the last year. The neighborhood also has a higher-than-average safety rating compared to other neighborhoods in the area. This is partially due to the fact that the Peachtree Park Civic Association (PPCA) has a close relationship with the local police to ensure the area’s safety. Of the above schools, Sarah Smith Elementary won a National Blue Ribbon School award from the United States Department of Education and Atlanta Neighborhood Charter school is ranked as an A school.